OTTAWA — Venezuela's pro-democracy movement has welcomed the decision by Canada and its allies to urge its country's military to switch allegiance and support opposition leader Juan Guaido as the true leader of their country. The group built on that backing in its final communique by calling upon "the National Armed Forces of Venezuela to demonstrate their loyalty to the Interim President in his constitutional functions as their Commander in Chief." They also called on the armed forces "not to impede entry and transit of humanitarian assistance to Venezuelans." Guaido's representative to Monday's Ottawa meeting, Orlando Viera-Blanco, said the decision was a key step in freeing his country from its economic and political crisis and putting in on a road toward democracy. "We have a huge relationship with different people in the army force. They are willing to collaborate and I am sure that this will be one of the most important events, topics, elements in order to accomplish a way out in Venezuela," said Viera-Blanco, who has become the de-facto ambassador to Canada of Venezuela's interim government — whose authority Maduro rejects. "We need more and more pressure on the top of the army corps, and in the top of the political dictatorship," Viera-Blanco said. Canada and the Lima Group of more than a dozen North and South American countries have backed Guaido as the legitimate replacement for Maduro, who followed left-wing populist Hugo Chavez into Venezuela's presidency after Chavez's death in 2013. Guaido is an opposition leader who's the head of Venezuela's legislature. On Saturday, an air-force general defected to the opposition and reportedly fled to Colombia. He posted a video on YouTube declaring his country's transition to democracy was "imminent." "As a country that has an open-arms policy towards Venezuelans, we have received many important figures from the democratic opposition," said Federico Hoyos, Colombia's ambassador to Canada. Two female protesters brandishing a banner and chanting "hands off Venezuela" breached security at the Global Affairs Canada building where Freeland and visiting representatives held a joint press conference to close the day. Two plainclothed police officers escorted the two women out without incident. 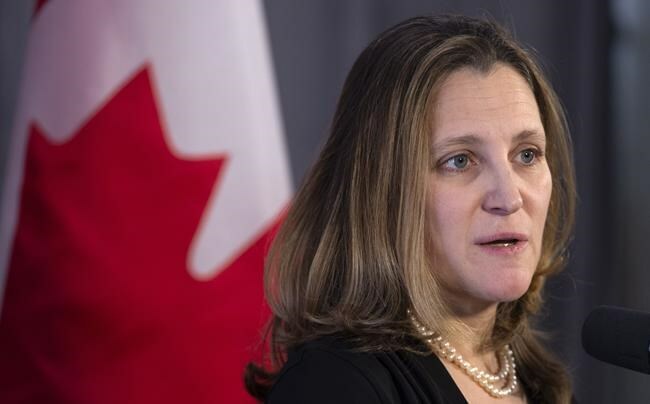 Freeland said Canada and its allies want to bring democracy to Venezuela, "the kind of democracy protesters in Canada do enjoy, and I am sad to say political protesters in Venezuela do not." She said the Lima Group was emphasizing a peaceful transition to democracy, led by the Venezuelan people in step with their country's constitution. She rejected any suggestion that Canada or the Lima Group are fomenting an armed overthrow of the Maduro regime. "Unfortunately we are still under a dictatorship in Venezuela at the moment. That is why it is time to increase pressure," Guaido said through an interpreter, his enlarged image hovering over the gathering on a movie-theatre-sized screen. "I would like to reaffirm ... our actions and our co-operation with the Lima Group, along with Canada, and all the countries." Trudeau announced $53 million worth of humanitarian assistance for the "most pressing needs" of Venezuelans. Canada has already contributed $2.2 million for the humanitarian crisis that's forced some three million Venezuelans from their homes, sending ripples across the region — particularly in neighbouring Brazil and Colombia, which are now faced with a refugee crisis. "This is a pivotal moment for the people of Venezuela — we are observing a widespread rejection of the Maduro regime's illegitimate claim to power following fraudulent elections last May," he said. Peruvian Foreign Minister Nestor Francisco Popolizio Bardalen said the emboldened Venezuelan opposition "represents the beginning of the end of the dictatorship." "If anyone believes that his management of the economy is in any way an example of how to go about it, then they need their heads examined." Canada and its Latin American allies in the Lima Group, along with the United States, have been pushing for Maduro's departure. On Monday European countries came on board, with Spain, Germany, France, Britain, Sweden, Denmark, Austria, the Netherlands and Lithuania calling for free and fair elections as soon as possible. French President Emmanuel Macron tweeted out his support Monday, saying France recognizes Guaido as Venezuela's "president in charge" and said "Venezuelans have the right to express themselves freely and democratically." German Chancellor Angela Merkel said Guaido is now Venezuela's "legitimate interim president."